jansenphoto – Page 171 – Dutch goes the Photo! A Fresh Perspective Photography is more than just a vehicle for capturing the world around me; it provides me with a palette and a set of brushes, with which I paint not only what I see, but also look to express the emotions that are evoked by the scene in front of me in that moment. Growing up in the Netherlands exposed me to a wide cross-section of visual arts that laid the foundation of my photographic view of all that surrounds me. Early influences were the Dutch Masters of the 17th century, to whom I was introduced by my grandfather during museum explorations; favorites among them are the scenes of quotidian life depicted by Jan Steen and Frans Hals and the vivid landscapes of Jacob van Ruisdael. My classical high school education was supplemented by the Boijmans Van Beuningen museum, where I spent many a lunch hour exploring its great collection. Here I was introduced to surrealism with a particular love for the approach taken by Salvador Dali; Dali also rekindled my appreciation for the work of Hieronymus Bosch, who often showed the folly of us mortals. Universal Connections My approach to any photographic subject is to look for understanding first; in this I look to establish either a connection between the viewer and the subject or capture the connection of the subject with its surroundings. The captured image then aims to portray this connection from a perspective that is part of my personal interpretation. This interpretation is often a form of externalized introspection, which may alternately display the connection of isolated beings and items with their environment or highlight the whimsy of the profound world, in which we find ourselves. The universe is full of connections, many of which are waiting to be discovered; part of my journey as a photographer is to document these connections. Any assignment, be it an event, a product shoot or a portrait session is always approached through communication with the client; this is where the first connection is established. Ideas are exchanged and a collaborative plan of action forms, ultimately resulting in a set of images that aim to exceed the expectations of each client. And, lest we forget, it is important to have fun while practicing the serious business of photography! 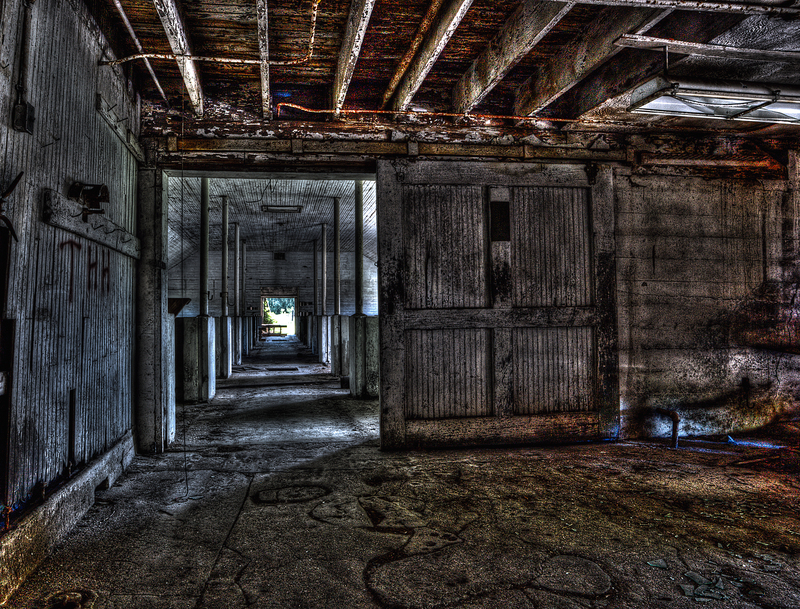 ‘Exeunt Omnes’ is a view towards a doorway and past stables in an abandoned farm building near the former Westborough State Hospital in Massachusetts. The environment is rich with detail that asks to be examined at leisure by the viewer. The scene invokes thoughts of being in a forsaken, lonely place, where those who came before have all left a long time ago. Despite their departure, we still feel them in how their existence impacted the environs in a palpable manner: initials on the door, drawings in the concrete, broken glass. What occurred at this site? Was it a warm, welcoming place at one time? Allow yourself to be drawn in to explore in detail what you see ahead. Follow those who came before toward the exit and the warm light that beckons. Heed their warnings as you pass. This image is an HDR composite of 5 exposures. Photomatix Pro was used for the HDR processing. It is also available as a limited edition print (16″x21″), which underscores the dramatic tension within the scene through rich tones and exquisite detail. 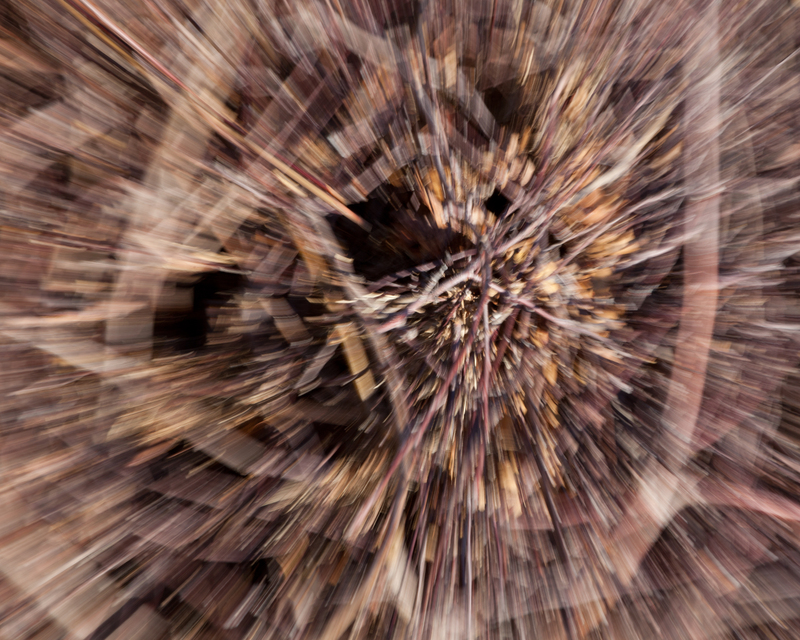 ‘Brush Abstraction 1’ beckoned me to explore its possibilities, as I walked past a seemingly innocuous pile of twigs that remained from cleaning up the apple orchard that I was photographing. As I examined the brush pile, I felt drawn into a possible point of entry into an alternate space; not the traditional wormhole as described in physics and science fiction, but a solid connection with a plane of consciousness that hummed with the universal energy which pervades the universe. As the eyes are relaxed and allowed to explore the various aspects of this image, you may feel your mind and maybe your entire presence drawn into the layered depths of exploration that surround all of us at all times. Go adrift and open all your senses while carefully listening to what they tell you. You may feel yourself accelerating at times, then spinning or alternately floating along threads within the universe that guide your everyday movements unbeknownst to you. Enjoy the feeling and breathe in the experience. Be sure to detach yourself slowly from this journey, so that its effects connect and possibly enrich into your daily life. 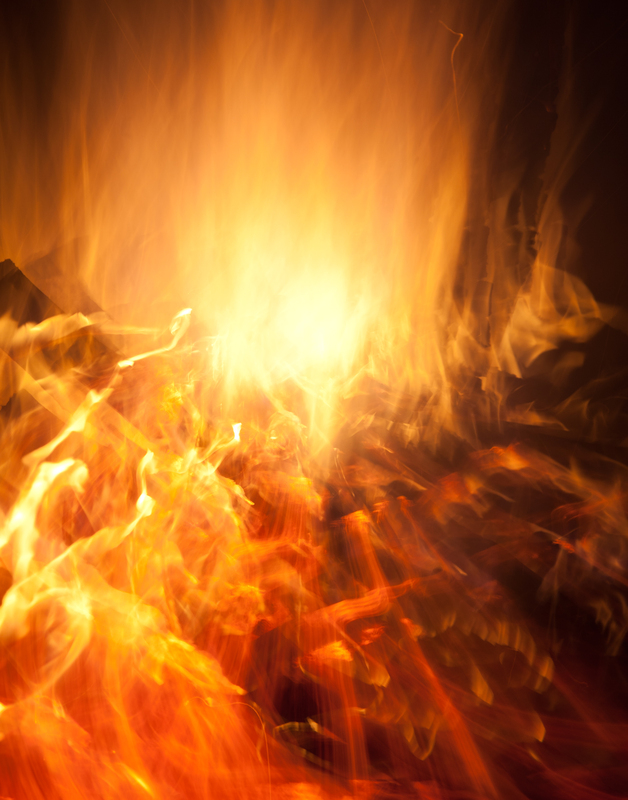 After reading this blog entry, click on the image and spend a minute or so absorbing the visual content while focusing only on your breath, as in meditation. Take a moment to reflect upon where the image takes you, and please share your experience in a comment to this entry; I look forward to hearing about your journey! This image was captured at 100 ISO, F/22 at 1/13 second shutter speed. 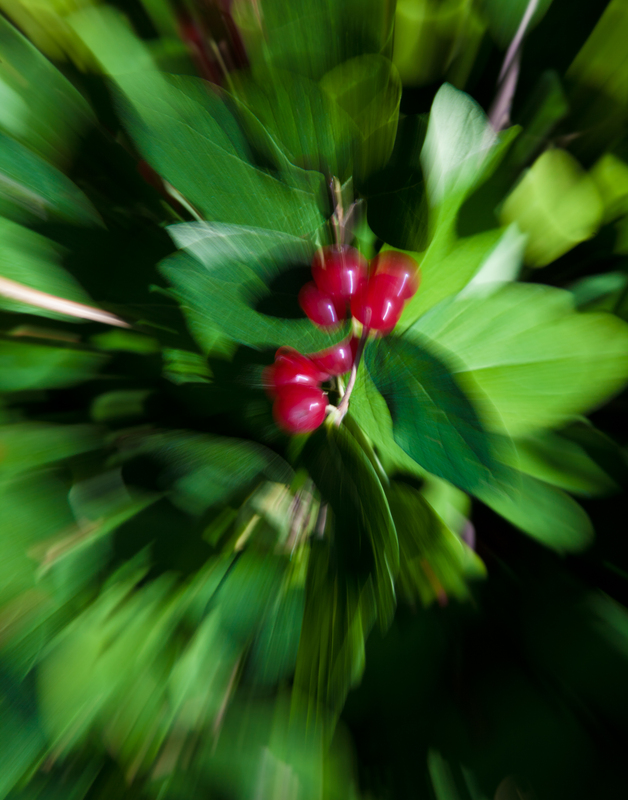 A snap zoom twist was employed to get the radial blur. ‘Cryptomorphosis 1’ received its title from what it performs in front of the viewer: the hidden (cryptic) content is transformed (morphed) to reveal itself. An ethereal shape takes form in this image, as the energies flow through it, or, possibly, radiate from it. Careful observation of nature in all its forms may lead us to uncover latent structure that resides beneath the first layer that we see. The outer sheath presents a first order approximation of the power that dwells within each aspect of the flora and fauna of our planet. As we know from Einstein’s equation that mass contains massive amounts of energy, we merely need to peel back the outer coverings to allow the living spirit within to appear before our eyes. But this process is similar to what happens when we catch something with the corner of our eye, only to have it elude our senses when we turn to look straight at it: only at the most oblique angles and with all our senses attuned, will the cryptic form reveal itself to us. Next time when you encounter Mother Nature in your daily travels, relax all your senses and let your intuition guide you where to turn your eyes to uncover what lies beneath the surface; you may surprise yourself and see an entirely new light! This image was captured at 100 ISO, F/22 at 0.4 second shutter speed. 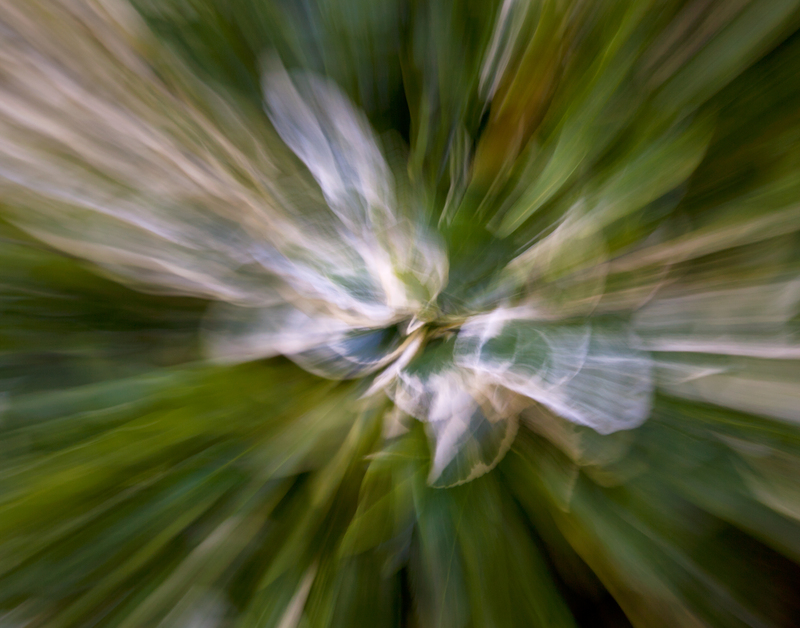 A gradual zoom twist was employed to get the radial blur, while taking an angle that would smear the white tips of the variegated vine to the upper left of the image. In ‘Orchard Tilt’, the viewer is invited to release their mind from the bonds put upon them by the prevailing realities of the dimension, in which they travel, and let it escape to pull them into an alternate dimension, where they are free to explore and discover all that lies just beyond. In our dreams we may find ourselves flying, as we are given the opportunity to go beyond gravity’s grasp into the sky; this infers a desire for exploration to push beyond the boundaries, within which we live our daily lives. This very desire sets us apart and enables us to envision possibilities, strive for the heavens and achieve what was once described in fiction only. Another aspect of ‘Orchard Tilt’ is that it provides a depiction of where the mind can go, when it moves beyond the limits of the body. This is much like the experience one may have during meditation. This image was captured at 100 ISO, F/22 at 0.16 second shutter speed. 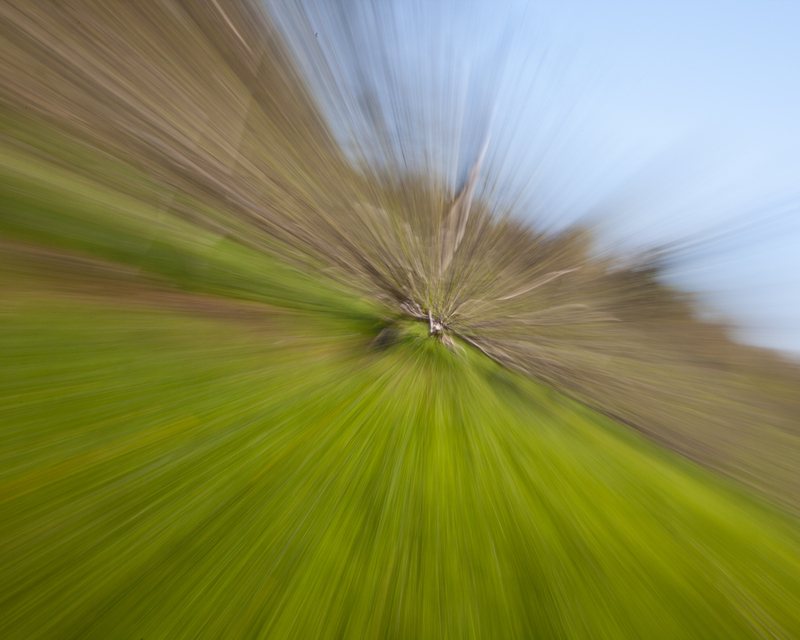 A fairly rapid zoom twist was employed to get the radial blur. 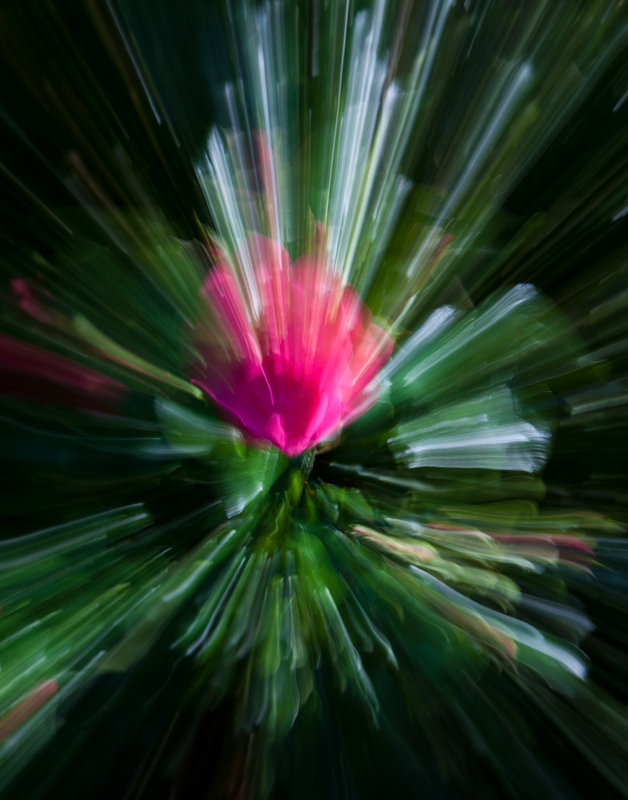 As the title ‘Rose Particle’ suggests, this image centers on the streams of energy emanating from the singularity presented by the dark pink rose. The rose becomes at once the object of beauty, to which our eyes are drawn, and the center of energetic particles radiating outward from the forces contained within it. As each object within the universe holds latent energy, so does the rose, as it demonstrates here. The counter play between beauty and strength is as the yin and yang, the duality that resides within each of us. This duality is held together through the cosmic vibrations, which can be ascertained in moments of great quietude of mind and body, such as achieved during meditation. Whereas the rose has revealed its cryptic energies through this image, one may find that the image enables the centering of similar energies. If the image is studied while directing focus on the process of breathing, as one does in meditation, the rose may become a guide. This image was captured at 100 ISO, F/22 at 0.3 second shutter speed. The bright white streams originate from the sun’s reflection on the shiny leaves that surround the rose. It has been a couple of weeks, since I wrote the previous post in this series, and I promised to do a bit of a deeper dive into what lies beneath the surface of the process of capturing these images. In terms of photographic technique, the ideas are rather simple and mastered relatively quickly. Most of my personal photography projects tend not to last very long, as quickly I start looking for novel ways to capture and present material; at such a time, I usually put the project aside for at least a year or so, waiting for it to feel fresh again when I go for the next image in a series. This project has been different, in that I have been shooting in this genre for about 18 months at this time, and it has not felt stale to me yet. As this surprised me, I started looking into the how and why this project is different. I am certain that there are other elements that I may uncover, as I push forward in this project, but these appear to be the drivers at this time. Discovery – photography is a journey of discovery for just about all of us, who have picked up a camera and started shooting in earnest. This project has afforded me continual discovery through opening up all senses and taking input from all of them in the process of capturing content that is not just visible to the eye. This deeper sense of uncovering this cryptic that lies hidden within the world around us has opened my mind’s eye to further explore these scenes in new directions. These include examination of the scene not only in its current juncture within the space-time continuum, but also past and future lines that may be occupied by the players on stage within the scene. This has opened up some connections that I had hitherto not observed, some of which demonstrate how universal forces flow through the quotidian. Emotional Connectivity – as I deepened my exploration, part of which included opening up all senses to the environment in which I found myself, I started noticing a sense of emotional connection to what I found within the scene. In a manner, which can be likened to meditation, a more complete sense of the image, as it should be captured, is refined by opening up the senses to subtle emotional triggers. It can be described as opening oneself up to a feeling washing over the entire being and letting that guide the decision making process for how to capture the image. This feeling is more pronounced for certain images that others. Re-Examination – upon capturing an image, the next thing I do is a taking stock of how it felt to capture the image. I take sensory stock of the image rather than examining it visually (I am not a big fan of chimping, but one could say that this is a sort of sensory chimping). Without looking at the image, I will then make a decision to either shoot the scene with some adjustment, which can be slight or radical, or if it feels just right, I then walk away from it. I find that the success of the process depends more on my ability to quiet all my senses and open myself up to my surroundings; this is where the simile with mediation extends, as I will use meditation techniques to improve my feel for the environment. In this process, I do not over-analyze how I might be able to capture the feeling that lies before my lens; a couple of rough guesstimates guide my camera settings adjustments, as I let intuition be my guide. In subsequent posts, I will move away from technique, but rather focus on individual images. I will try to explain some of the sensory information that came together in the creation of each image and how I view the image afterwards. Many of the images are viewable in the Kryptomorphaics album on the Frank Jansen Photography Facebook page. In last week’s post, I touched on some of my motivations that have driven me to start experimenting with my photography: looking to differentiate my photography and provide a creative outlet. 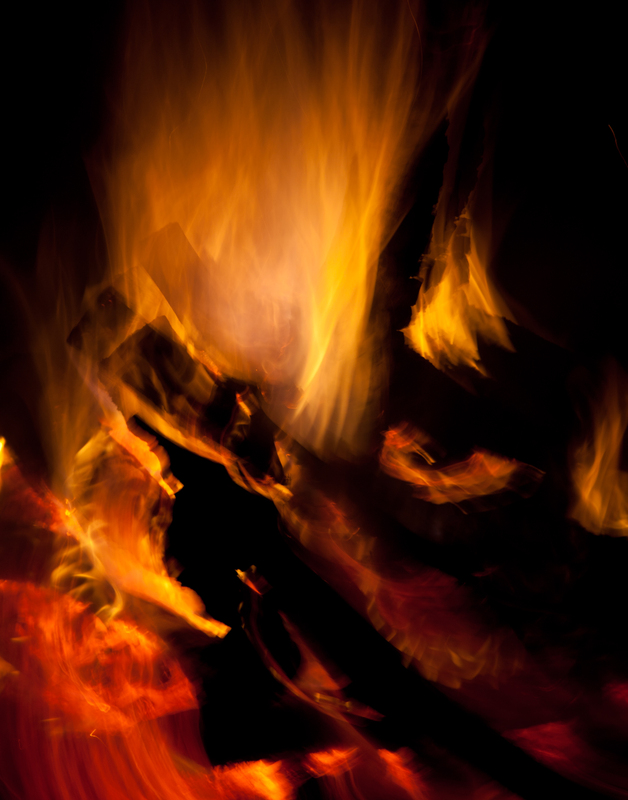 In another post, I will explore these more deeply, as there are several other aspects that have led me to evolve a deeper connection to these images. As a number of photographers have asked me how these images are created, this post will describe some of the techniques that I use. This is by no means an exhaustive treatise on experimental photography, but rather is intended to lay bare some of my basic approaches to a style of photography that has allowed me to reveal some new imagery. If I inspire some people to go out there and play with their cameras and lenses to produce some images that they had not thought about previously, my goal will have been met! The Equipment – it is pretty basic, but not to be overlooked: a single lens reflex camera with a zoom lens. There are no special requirements of the camera other than that it can be put into a manual mode; most any DSLR will be ideal for experimenting, as you get the opportunity to get a feel for the results on your camera’s LCD panel. As for the lens: a zoom lens with a reasonable medium range of focal lengths works well. Most often, I use a 24-105mm lens for most shots (on a full frame sensor camera). I have tried out some different zoom lenses, such as a 17-40mm and 75-300m, but have not been as pleased with those results. The Process – in the age of achieving a specific image look in post-processing, we are going back to the days of doing everything in-camera. And, no, we are not going to use some fancy setting of the camera or a high-end software component within the camera. We are going to do the entire capture the old-fashioned way: manually. First: set your camera to manual mode. It is possible to create the image in another mode, but I have found it easier to work this in manual mode, as shutter speed is eliminated as a variable; in all honesty, I have not tried any captures with shutter priority mode, as I want to make sure that I know what my aperture is beforehand. Second: take a test shot to get a feel for your composition. The test shot should be taken at one end of the zoom range you are planning to use or the other; more about zoom range in a bit. 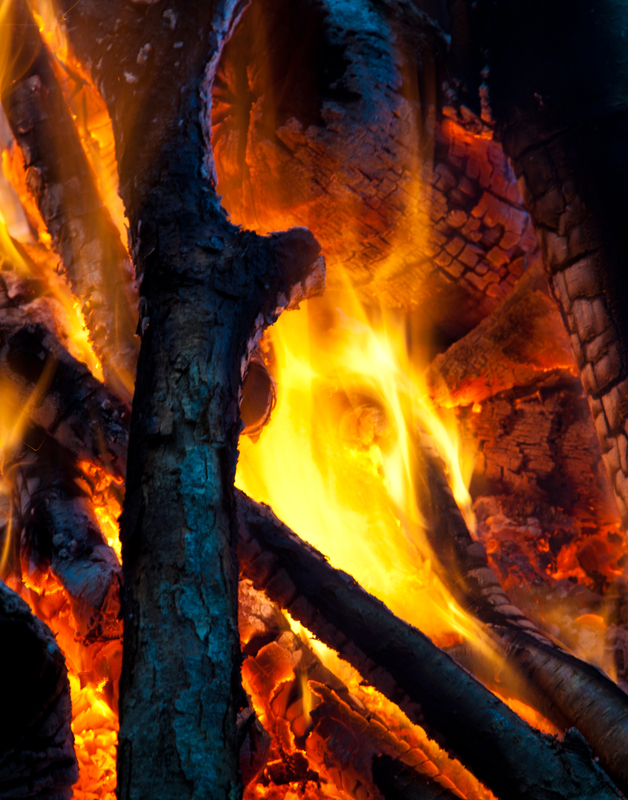 This shot is to get a feel for how you may want the dominant elements in your image to look, as in the example sequence here: Playing with Fire shows the test shot, which led to Pyrexplosive as the final product; note that the wood in the fire remained in the same location in the second shot. As one gets more adept at visualizing the desired shot ahead of time, it may be possible to skip this step. Zooming from tight to wide – this creates a look as in the above image Pyrexplosive. Smearing of light in a radially outward direction; note that light trumps dark, so that the light overlays any dark while going outward. 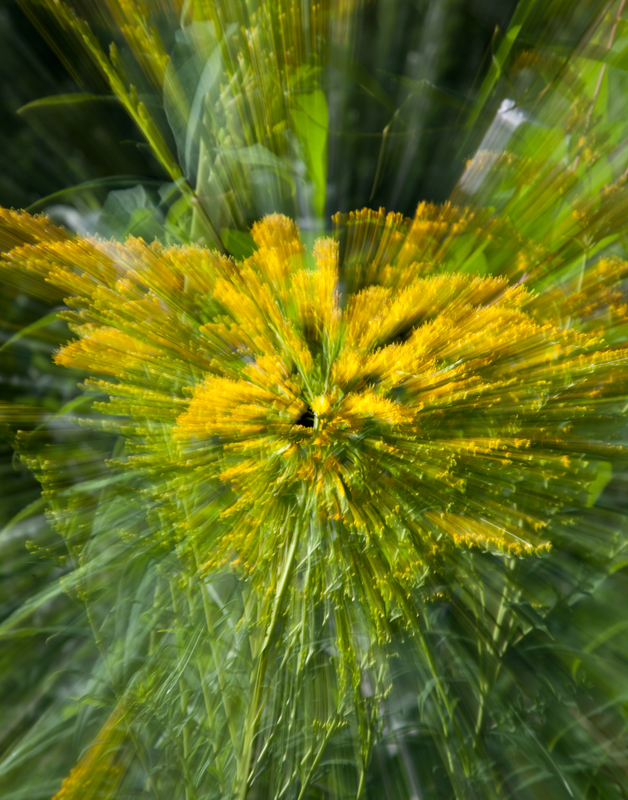 Zooming from wide to tight – this does the inverse of the above method and causes more light to be brought to the center of the image. The radial smearing is similar with the key differentiator being the concentration of light. 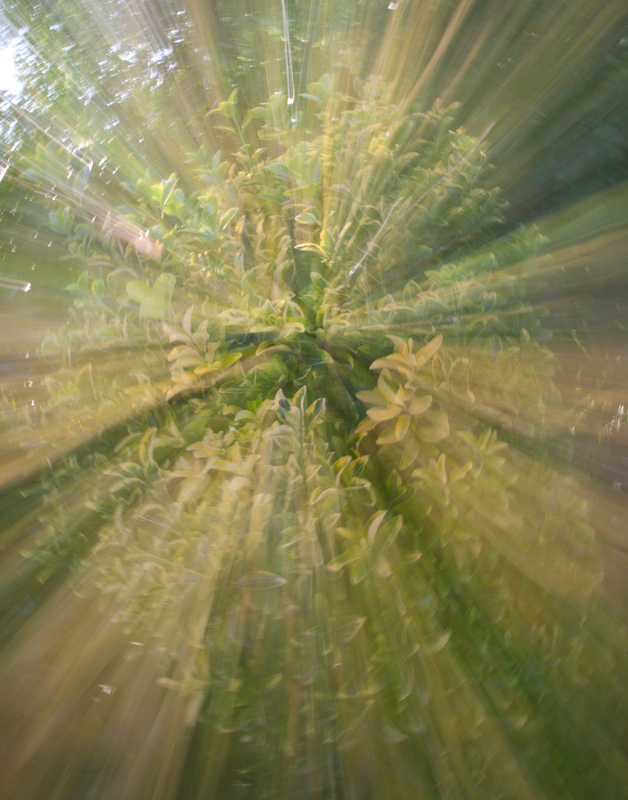 Camera rotation around fixed axis – this can be achieve on a tripod (or with steady hand) and causes circular light patterns, such as in the image Portal in the previous blog post. Camera movement – movement of the camera can be done in several ways. Either treat your camera as a videocamera and write with the points of light that you see or use linear or non-linear motion to create patterns, banding, etc. An example of the former can be seen in the image Connections in the previous post. Combination – any of the above. Your imagination is your only limitation in what you create here. 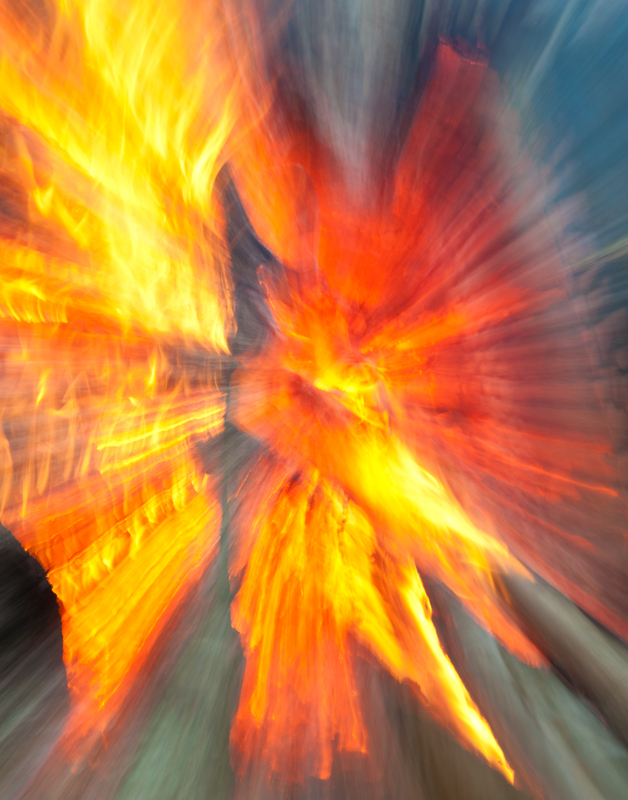 Pyroplasm 4 is an example of a zoom/rotation combination (mostly zoom with a little rotation). With each of the above effects, one of the key decisions is how much and how long to expose and use effects. The images in this blog post range in exposure times from 0.5 second (Playing with Fire) to 8 seconds (Pyroplasm 3), with varying degrees of movement. Fourth: experiment, experiment, experiment! I simply cannot overstate the importance of experimentation in your endeavors and pushing the envelope of experimentation as you become more comfortable with controlling the effects. With enough trial and error, you learn to control the image and ultimately will achieve the images that you visualize. Yes, there is more to this… As with most of our photographic exploits, there is more than just great technical execution to create an image that speaks to you and, possibly, others. My first forays into this area of photography were driven by an innate desire to experiment with my lens and camera and to see what would come out of it. This helped me work on my technique, so that I have developed a feel for how fast and how much I want to zoom in or out or rotate or move the camera. As I learned technique, I started exploring emotional content of the image and started pre-visualizing scenes or items in front of me, and how I could morph them into a completely different scene. These explorations have led to my acquiring a sense of deeper content, which may be hidden when viewed from the surface, but is looking for a means of materialization through the morphing process. In a sequel to this blog post, we will explore the process further and look at what is brought to the surface. That post will be published some time next week. In the meantime, more images can be seen in the Abstractions album on the Frank Jansen Photography Facebook page.